The National Baseball Hall of Fame and Museum opened in Cooperstown, New York, on June 12, 1939, and the Professional Golfers Association responded by inducting several legendary golfers, among them Bobby Jones, into its own hall. But the P.G.A.’s hall as yet had neither a building nor a plan for one. Clifford Roberts, who was Augusta National’s chairman and co-founder, embraced the idea and suggested several sites on the club’s property. His favorite, initially, was an elevated six-acre parcel roughly two hundred fifty yards to the east of the tenth green. This was one of the building lots that the club had been trying to sell for a decade. Among the advantages of the site, Roberts wrote to Jones, was that visitors to the hall “would have four good views of the course instead of one.” He also liked the idea that “members using the golf course would have a good view of an attractive building”—though from a distance. 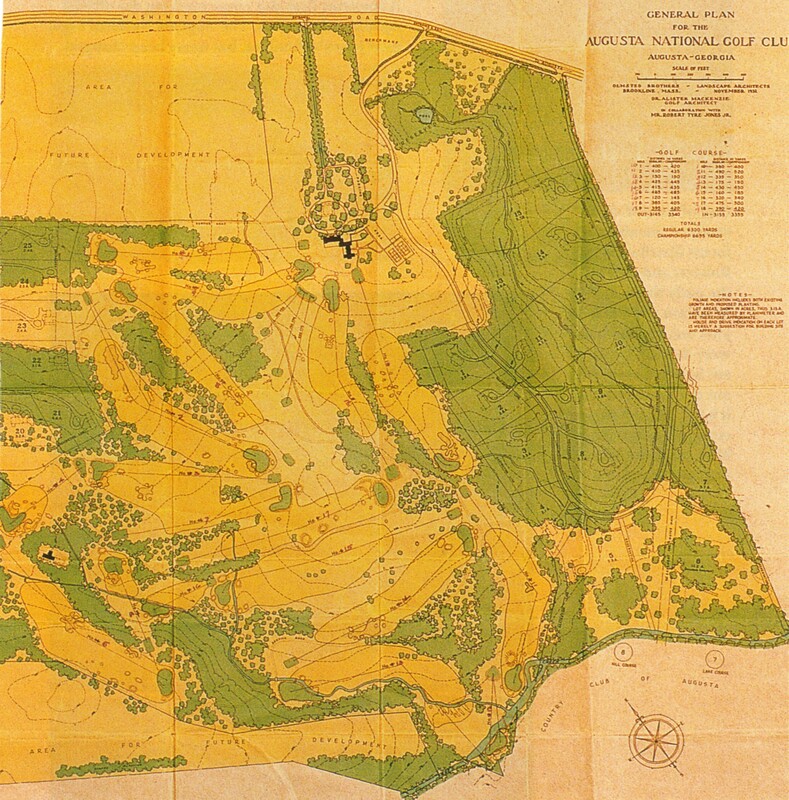 1932 Augusta National real-estate development plan, prepared for the club by Olmsted Bros. Roberts’s initial choice for a hall of fame site was on the east side of the property, to the east of the modern eleventh tee–in the green stuff on the map above. Roberts was especially concerned that golf’s hall of fame should be more compelling than baseball’s. A few days after the 1941 Masters, he wrote a lengthy letter to Olmsted Bros.—the club’s landscape architects at that time—in which he described a number of features that he thought ought to be included. “The more I think about it,” he wrote, “the more I feel that a building that houses a few plaques or a few bronze busts and that offers nothing else to the public, would prove to be a dull, worthless type of project, having no excuse for its existence except to attempt to glorify the leaders of golf. And I doubt that very much would be added to their fame.” One wing of the building, he continued, could contain “automatic movie machines,” which, for a quarter, would show instructional films by the game’s great teachers. Another wing could serve as both a comprehensive library and a bookstore. Visitors would be able to buy souvenir booklets, postcards depicting the Augusta National course, and “popular-priced copies” of some of the books in the library. Roberts’s boldest suggestion was to construct “a miniature Augusta National course surrounding the Hall of Fame which would be a practical pitch and putt course and could be made a most attractive part of the landscaping scheme.” The holes would be scaled-down replicas of the holes on the big course. He proposed a fee of twenty-five cents per round. He also suggested building an “especially attractive” public driving range based on a plan that Jones had come across and thought highly of. Despite Roberts’s enthusiasm, the project never came to anything, and there was no further discussion of building a miniature Augusta National. The two members that Roberts had been counting to pay for the project lost interest in it, and the club was not in a financial position to follow through on its own. And then news from Europe and the Pacific made other concerns more pressing. This entry was posted in Golf Courses, Masters, Masters Countdown, Tournaments and tagged Augusta National, Bobby Jones, Clifford Roberts, Golf Hall of Fame, Olmsted Bros. by David Owen. Bookmark the permalink. Maybe someone ought to have a legit hall of fame for golf with a set criteria of X amount of majors and Y amount of wins to qualify. Didn’t MacKenzie design an 18 hole short course for ANGC? If so, have you seen the plans? 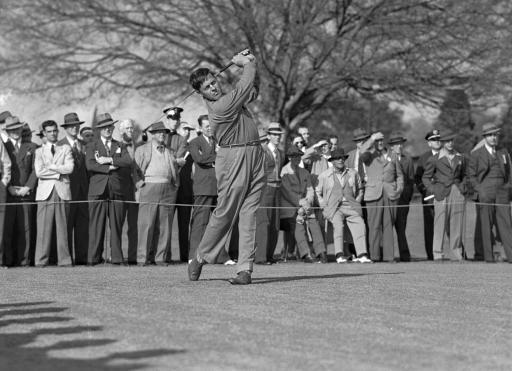 MacKenzie initially wanted to supplement the main golf course with what he called an “approach and putt” course — a nine-hole short course, which could be played with short irons and a putter. The course was to be four hundred to five hundred yards long. “There is, as far as I know, no interesting approach and putt course in America,” MacKenzie wrote in 1932 in a letter to Wendell Miller, the engineer who was then in the process of building the big course. “A really good one requires as much thought and planning as a full course. All those I have seen are terrible. I am just constructing one here [near San Francisco] which I hope will be most fascinating.” Roberts shared MacKenzie’s enthusiasm for the idea, but Jones was skeptical. After walking the proposed site with an engineer late in 1932, Jones asked that the short course not be included on the site plan but that the area instead be labeled “Reserved for Park.” The plan died, not only because of Jones’s lack of interest, but also because there was no money to pay for it. Still, in 1933, MacKenzie drew plans for an eighteen-hole, 2,460-yard short course. (The longest hole was to have been one hundred and ninety yards; the shortest was to have been sixty.) It was never built, either.